On Monday night Grey Bush, The Baron and I visited the excellent Oak Barrel for a Kilchoman Masterclass. The Baron had to educate me that Kilchoman is the newest Islay distillery. The first distillery to open on Islay in 124 years, Kilchoman filled the first casks in December 2005. The very passionate founder Anthony Wills hosted the masterclass as part of a promotional tour of New Zealand, Australia and Taiwan. I was absorbed hearing Anthony talk about the process of opening up a distillery. He and his fellow investors have sunk £4.5m into the distillery so far. There have been trials and tribulations with the planning authorities. With cash tight they have also had to decide whether or not to spend £20,000 commissioning their own bottle mould (which they did). Kilchoman only produces 300,000 bottles per year. Anthony isn't looking to mix it with the big boys. He seems content on being a small producer and trying to produce a premium product. Malting his own barley and sourcing the best barrels he can find. He spoke passionately about the desire to produce 'fresh', 'young' and 'fruity' whiskies without age statements. However, as he was delivering the sell I couldn't quite forget that his background is in marketing. Kilchoman currently only have young whiskies, so he has no option but to promote them? Anthony's passion reminded me of when I got to speak to David from Bakery Hill at Whisky Fair. The pitch against age statements also reminded me of the Glenmorangie Masterclass (although the presentation was infinitely better!). 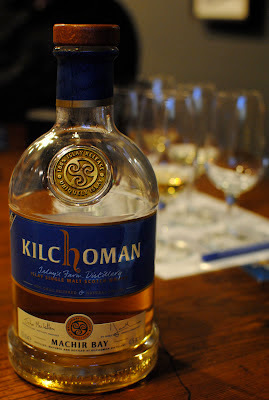 During the evening we got to taste five Kilchoman whiskies. The Machir Bay is the whisky that they are trying to develop as their signature bottle. We also tasted three different 3yr olds and one 5yr old whisky. 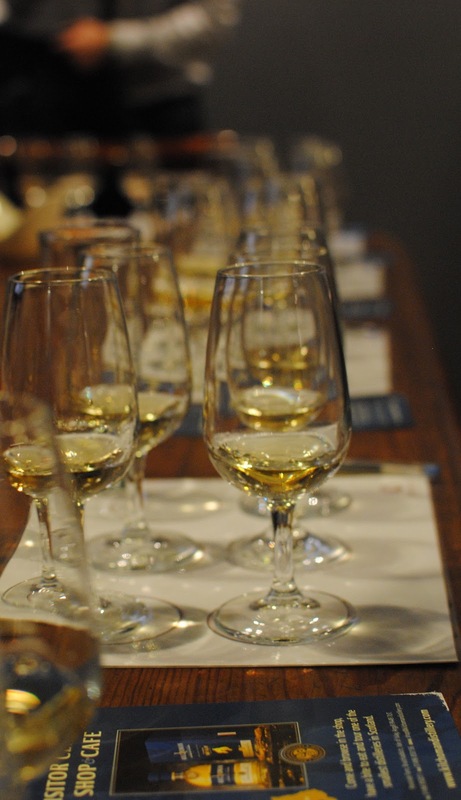 All of the whiskies were quite similar in style. They had bright and fruity noses. Subtle creamy peat on the palate with hints of spice from the wood. Finishes were long and not particularly pleasant. I was getting taste I couldn't put my finger on. When I consulted The Baron he immediately remarked 'ash'. I don't really fancy a mouthful of ash. I enjoyed the evening. It was illuminating to hear the passionate Anthony speak. However, the whiskies are not to my liking and I just can't move beyond the finish. They lack in complexity too and I think it would benefit the character if the whiskies if they spent longer in wood. I'd prefer a bottle of Laphroaig 10yr old at half the price every day. If I was to give a dram I'd say two and a half our of seven. Finish: Long, a little unpleasant, ash? Palate: Creamy, more peat. Not much else happening besides the peat and cream. Cutting with water was a mistake as it brought the ask through on the finish. Palate: Spice, peat, medicinal. Adding water made the whisky drying (if that isn't an oxymoron) and brought fruit on the middle of tongue. Again, the finish was better when not cut with water. Palate: Sharp spice on front of tongue. More character from the extra two years in bourbon casks. Finish: Long, dry, fruity. The ask settles in.